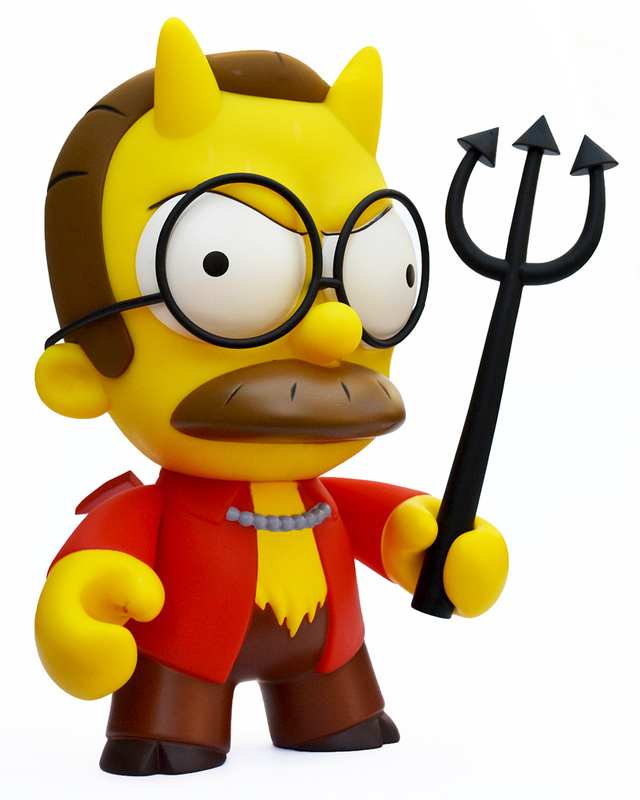 Reviewed: Devil Flanders by Kidrobot (2017) | 'TAIN'T THE MEAT… IT'S THE HUMANITY! With Halloween fast approaching it seems only appropriate to take a closer look at one of Kidrobot’s newest — and certainly biggest — oversized vinyl toys. Fresh from hell comes Homer Simpsons’ nemesis, Devil Flanders! 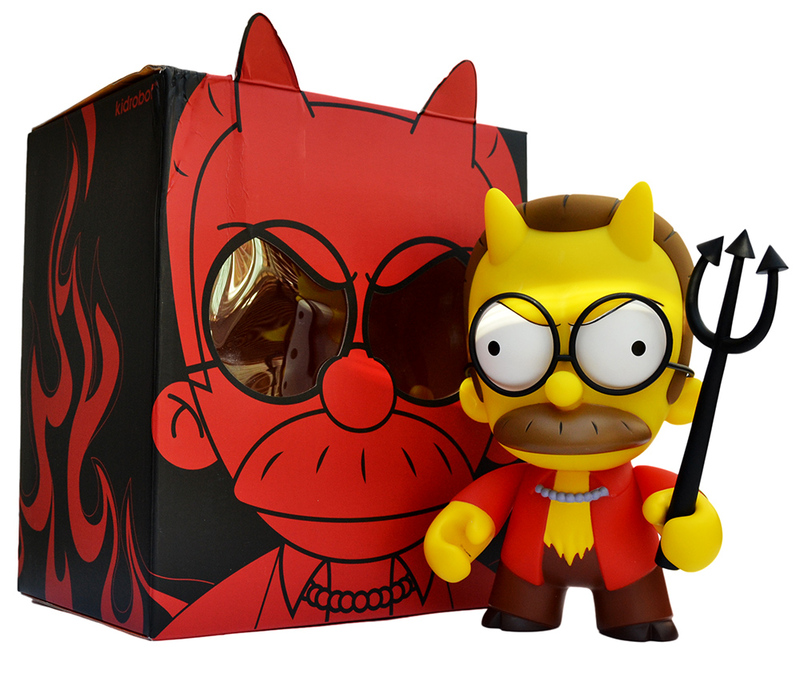 Devil Flanders with the box (love the eye holes!). The annual Treehouse of Horror Halloween special has been a staple of The Simpsons since its second season, way back in 1990. Each of these specials feature a trio of ghostly-themed stories, all of which come with a twist. Treehouse of Horror IV, from season five of The Simpsons (broadcast on 28th October 1993), featured one such segment — The Devil and Homer Simpson — where Homer sells his soul to the Devil for a doughnut. It’s a great segment, made even funnier by the reveal that the Devil is none other than Homer’s goody-two-shoes neighbour, Ned Flanders (“it’s always the one you least suspect”). 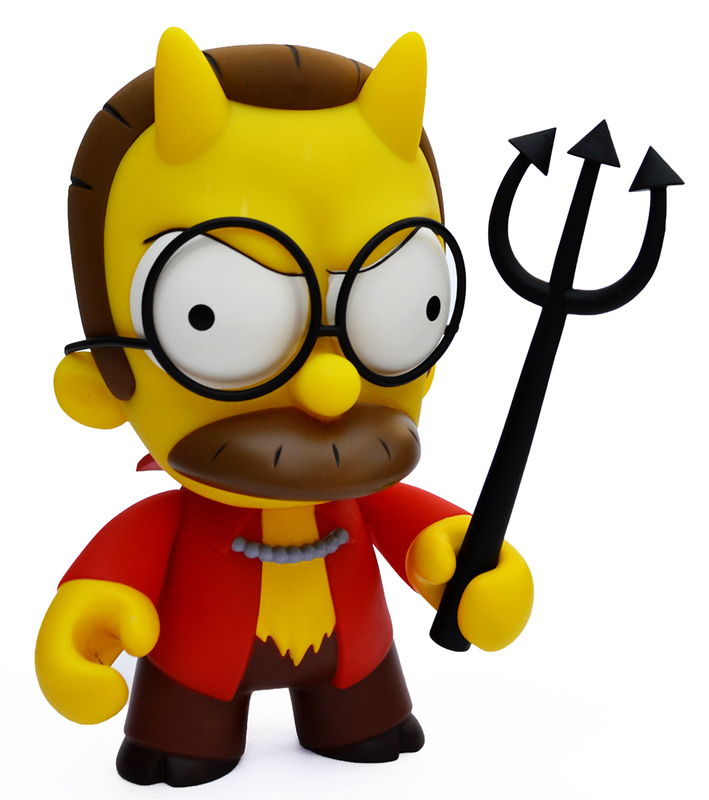 Released by Kidrobot in October 2017 this oversized Devil Flanders vinyl figure celebrates that classic episode. 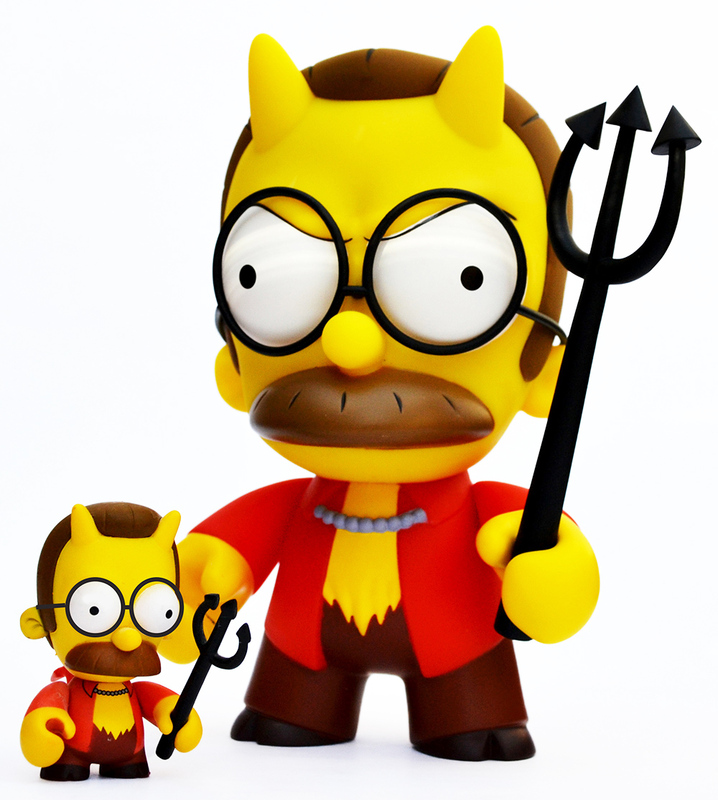 And I do mean oversized: in the past Kidrobot’s large vinyl toys have averaged about 6½ inches in height, while Devil Flanders is a whopping 8½ inches tall, making it one of the largest vinyl toys Kidrobot have released. 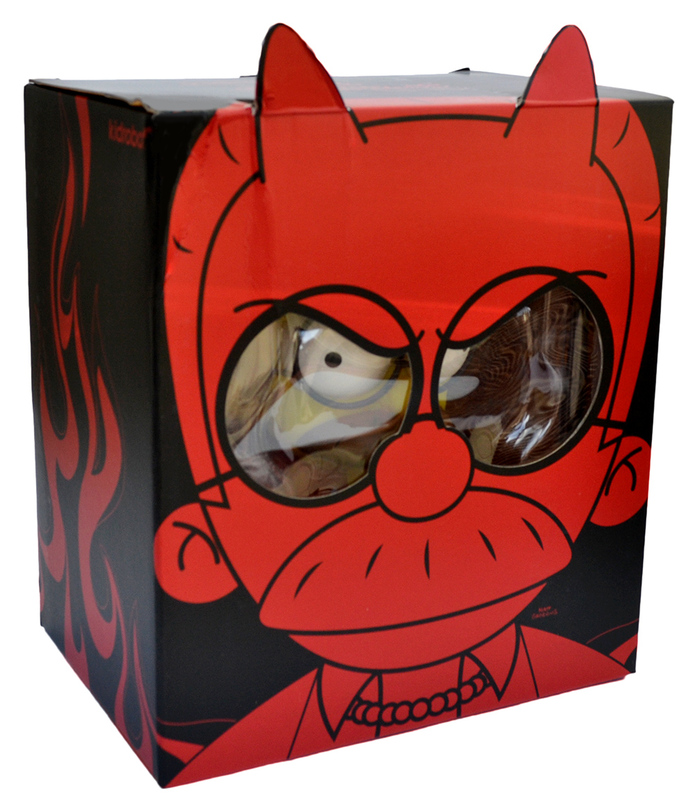 Devil Flanders ships in a large colourful box that features Flanders face on the front with two display window ‘eyes’ that the toy peers menacingly through. 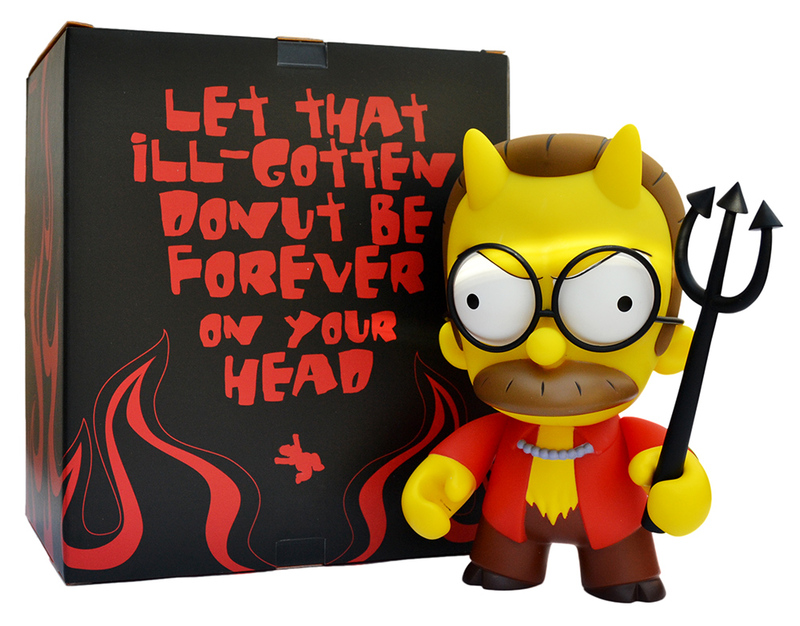 The black box is adorned with red flames and Devil Flanders‘ farewell curse to Homer is reprinted on the back (“let that ill-gotten donut be forever on your head”). The overall effect of the box is terrific, and it’s easily one of the best Kidrobot has released. What really makes the packaging stand out though are the fold-up devil ears at the top of the box — a terrific touch that really does this vinyl toy justice. 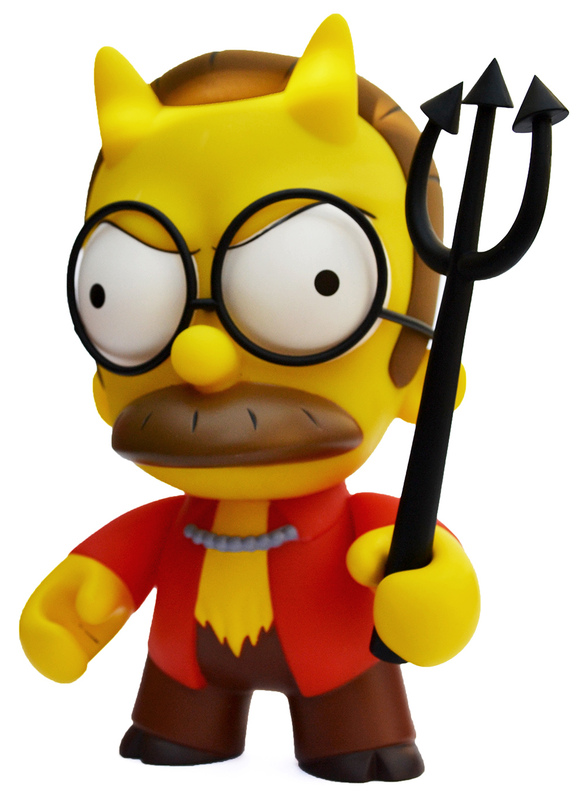 Devil Flanders comes with one accessory (I’m not going to count his glasses), his trusty black pitchfork, which slips tightly into either of his hands. The toy is both sturdy and satisfyingly chunky — pretty much what you’d expect from Kidrobot. The figure also features three point of articulation: his head and arms move. I only have one minor quibble with the figure, and that concerns the paintwork. On the whole the paint job is very well done and the bright colours really jump out. However, the paintwork around Devil Flanders silver cloak chain bleeds into the yellow a little, and the eyebrows overlap the white of the eyes. On top of that the black paint of the pitchfork leaves a smudge on the inside of the toy’s hands. (I noticed a similar problem with the oversized Beefsquatch figure from Kidrobot’s Bob’s Burgers range of toys). These aren’t big problems — and they certainly don’t detract from the figure’s overall impact — but I’d be remiss if I didn’t mention them. 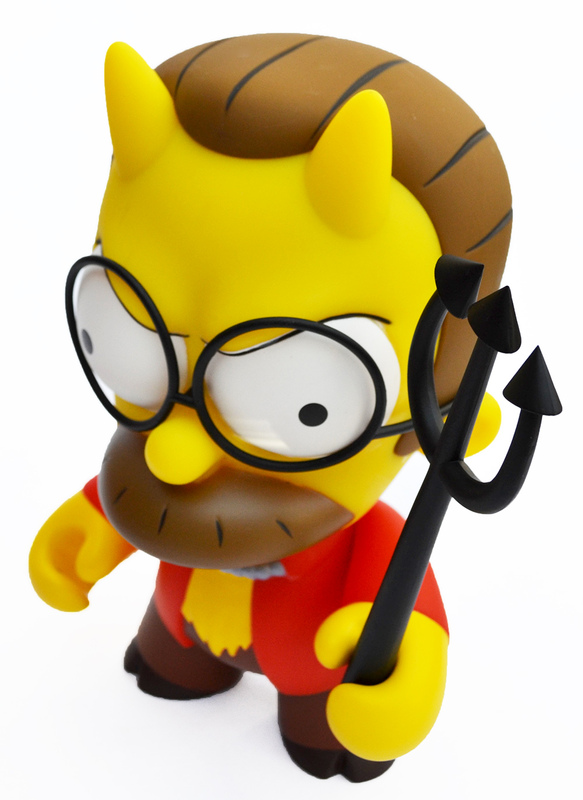 This oversized Devil Flanders is an almost exact replica of the three-inch version that was released as part of Kidrobot’s first collection of blind-box Simpsons figures back in 2008. The only difference between this and its smaller counterpart are the addition of his glasses and an evil scowl, which the smaller version didn’t have. (However, since I’m a sad completest I’ve added glasses from one of the other three-inch figures just so they match). The Devil Flanders, from all sides. Devil Flanders retails for $49.99, or £38, which is pretty much what I paid for mine. Despite being out for just over a year it’s still in stock but I suspect that won’t last long; the figure is just too good (and too damn big) to be idling on shelves for too much longer. Devil Flanders is both a worthy addition to Kidrobot’s growing ranks of oversized vinyl toys, as well as a welcome addition to my collection. Everything — from the excellent packaging to the figure’s size — is truly impressive. In fact you could say it’s devilishly good! And at £38 you won’t have to sell your soul to own one.